Preheat the oven to 500°F. Sprinkle garlic salt on the chicken. Heat a grill pan over medium heat, spray it lightly with non-stick cooking spray, then cook the chicken on both sides until cooked through. Toss the sweet potato cubes on a baking sheet. Drizzle with olive oil. Place in preheated oven and allow to roast, turning with a spatula every 4-5 minutes or so, until the sweet potatoes are tender, about 15-20 minutes. In a large bowl, toss together the pineapple, black beans, chopped onions, cilantro and honey. Stir in the hot roasted sweet potatoes once they come out of the oven. 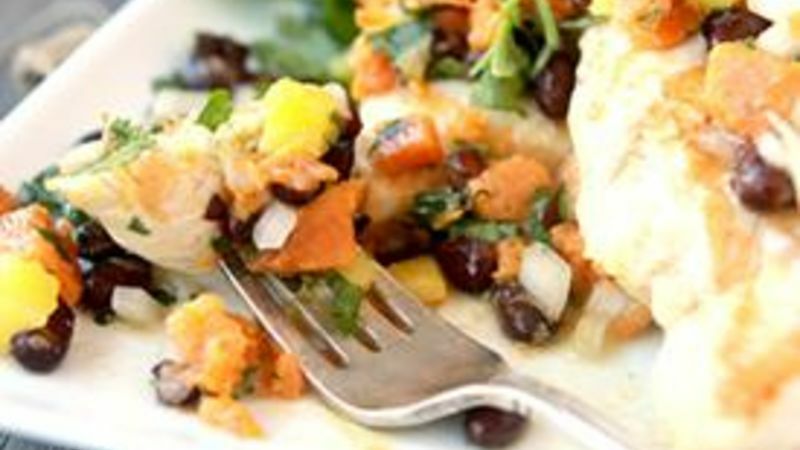 Serve the chicken topped with the Sweet Potato Salsa and enjoy! Pull out those sweet potatoes and roast them right into a succulent salsa that pairs perfectly with tender grilled chicken! It's easy to think quick cooking means something unhealthy and bad for you. But this easy recipe is totally great for your body, mind, and taste buds! Roasted sweet potatoes combine in a hearty salsa with black beans and fresh pineapple, making a truly tempting dinner. This easy Chicken and Sweet Potato Salsa recipe takes just a few minutes to make and even less time to snarf into your belly! Season four chicken breasts with a bit of garlic salt, then pop them into a hot grill pan. Cook until golden brown on both sides, and cooked right through to the center. Toss a cubed sweet potato onto a baking sheet, drizzle with olive oil, then roast in a hot oven until soft. As soon as your sweet potatoes emerge from the oven, mix the together with fresh chopped pineapple, onions, black beans, and salt. Drizzle a smidgen of honey right on top. This is a very good time to use your kitchen prowess as a taste-tester. Just grab a spoon and take a bite. No one will ever guess. Spoon the salsa over your cooked chicken.